There are currently many HD video converters in this field, which claim to be the best HD videos converter. But if you got the idea of HD conversion for a long time, you must know Pavtube HD Video Converter is a program of the first batch supporting HD video conversion. We are continuing to update and comfort our users with mature technology. 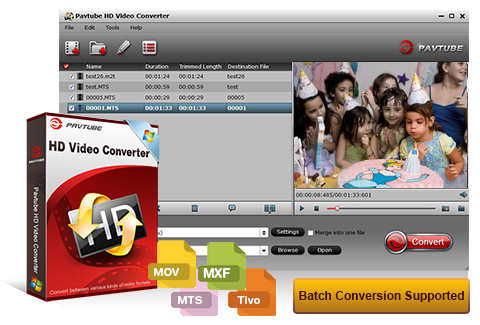 Pavtube HD Video Converter is the perfect software to convert any HD/4K videos like AVCHD MTS, M2TS, TS, MXF, TOD, MOD, MKV, AVI, MP4, MPG, DivX, XviD, WMV, H.265, QuickTime MOV and more to any formats you need. It is capable of converting all recordings from HD camcorders or cameras easily and fast. With it, you can easily convert HD videos to best supported formats for editing software and portable devices, it has rich optimized formats for NLEs like Windows Movie Maker, Adobe Premiere Pro, Sony Vegas Pro, Avid Media Composer etc and devices like iPad, iPhone, Android tablets/smartphones, Windows tablets/mobiles, HDTVs, etc. You can also use it to extract audio from videos and convert to MP3, WMA, WAV, FLAC, M4A, OGG or other audio formats. Besides, this HD video converter comprises powerful editing functions, it is easy to trim video clips, crop video playing area, merge several files into one, add watermark to videos, convert 2D to 3D, add subtitles, and adjust video contrast, brightness, saturation, hue and volume. Convert any videos of up to any video in 720p/1080P/1980p and audio files between almost all formats like MP4, AVI, FLV, MOV, WMV, MKV, M4V, MPEG, 3GP, H.265, VOB, WRF, XAVC, XAVC S, XAVC L, MXF, MTS, M2TS etc. The best video converter you could ever get for converting video and audio files. By converting video and audio, you can enjoy on Apple devices (iPhone/iPad/iPod/Apple TV), Android devices(Samsung/Sony/Surface), media players like Windows Media Player, VLC, 3D display devices like Samsung Gear VR headsets, add to video editing software like Windows Movie Maker, Sony Vegas Pro, Sony Movie Studio, Cyberlink PowerDirector, VirtualDub etc for editing, upload to online video sharing sites like Facebook for sharing, and more. Trim video to millisecond, crop video to precise size, adjust video brightness/contrast/saturation, set audio volume, add image/text watermark, rotate video for speical angle. Get a video file with personafications. Set video parameters like Video Codec, Quality, Video Size, Bit Rate, Frame Rate, Aspect Ratio and audio parameters like Audio Codec, Quality, Bit Rate, Sample Rate, Channels to get desired video files. Folder-reading function lets you import multiple files at a time, and batch conversion function allows you to convert many files at every turn, saving time and energy. All-in-one video converter download to convert video and audio at ultra-high speed and guarantees you with top-class output quality, so that you can enjoy media files contentedly. "Luckily, Pavtube HD Video Converter solved all my video incompatibility issues. I like it!" "Best H.265 converter to convert my recorded H.265 shootings to any format. Even crazy with lots of video presets for mobile devices!" "I shoot video from a DJI Phantom 4 platform and convert my 4K files with PavTube HD converter for my editing in Windows Movie Maker." "I used pavtube to convert .avi files to mpeg2 files. Fast speed." PS: Mac version please get Pavtube HD Video Converter for Mac. It is compatibility with macOS Sierra, Mac OS X 10.11 El Capitan, 10.10 Yosemite, 10.9 Mavericks, 10.8, 10.7, 10.6, 10.5.